- Super high resolution at Full HD/1,920 x 1,080 created by high sensitivity MOS Sensor. - Multiple H.264 (High profile) streams (max. 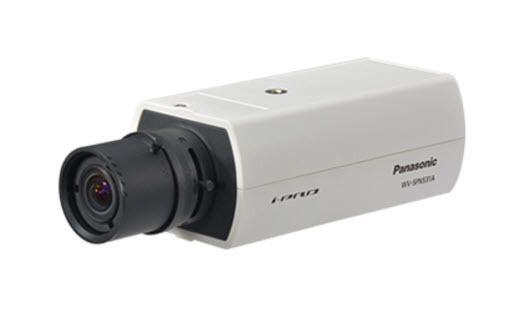 4 streams) and JPEG streams ensure simultaneous real time monitoring and high resolution recording by new enhanced "UniPhier®", Panasonic's proprietary System LSI platform. - High Speed ABF (Auto Back Focus) ensures easy installation. - SDXC/SDHC/SD Memory card slots for manual recording (H.264 / JPEG), alarm recording (H.264 / JPEG) and backup upon network failure (H.264 / JPEG). Realize long-term recording and auto backup function. - Can be added new intelligent extension software in addition to built-in VMD (Video Motion Detection), alarm function. - Super Chroma Compensation function realizes a better color reproductivity even in low illumination. If a bright light source such as car headlights points in the driection of a camera, the camera corrects for strong lights and their surroundings to provide clear images of the areas.